Testosterone propionate (testosterone propionate) - the third injectable testosterone ester, after testosterone cypionate and enanthate. This drug is often overlooked by athletes. Athletes give preference to similar injections, such as cypionate or enanthate ubiquitous. You might think that there is nothing unusual testosterone propionate, then let's take a look at its features and it will change your view. 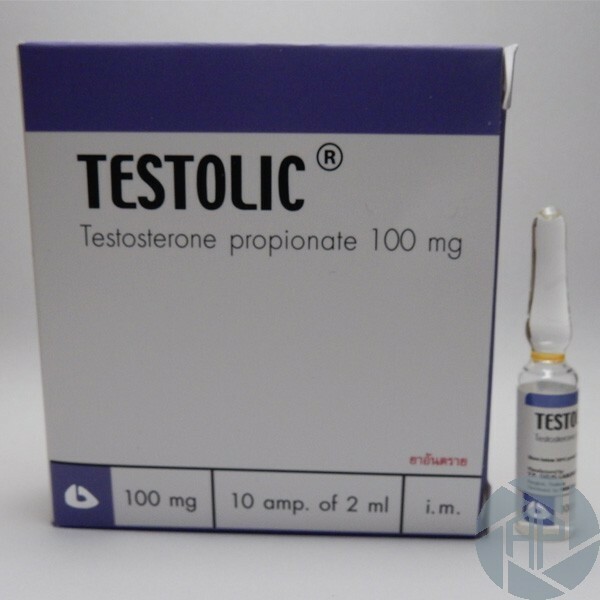 The main reason for the failure of this testosterone is not their prevalence, young athletes think so - just do not take the other, and then it should not be, and yet very few people are fully familiar with the properties of Testosterone propionate its capabilities and features of your application. Indeed, testosterone propionate is significantly different from similar products that, in many respects, is even better than enanthate or cypionate already mentioned, mainly due to the quality of those without testosterone data. The first and most important difference between testosterone propionate its "competitors", which is the duration of effect. Compared with drugs that have a very long period of application and exposure (cypionate and enanthate) propionate begins to act on the human body almost immediately after application, which in turn gives you another distinct advantage, accelerated period application. For example, when a dose of 50 mg of testosterone increased steadily for 2 days and 250 mg in the application 1-2 weeks. The second significant difference is that a small amount of accumulated water, and therefore smaller periods of "drying". The main advantage of this testosterone is what the drug has inherited all the best aspects of his relatives testosterone. The strong androgenic action of testosterone propionate, which allows you to actively promote the athlete in the overall weight, increasing energy and motivation to exercise. A well-known fact that when taking testosterone propionate, an athlete is already in the first week there is an increase in strength, energy, and increased appetite. In the primary or initial receipt of testosterone propionate most athletes, athletes, and sportsmen, simply select a small injection of 50-100 mg each. With this kind of reception, we recommend that you also start in the parallel rather prolonged course of injections of testosterone enanthate. For those who are not used to wait long for the positive dynamics taking steroids, I advise taking enanthate injections of 250 mg each and 50 mg of propionate. In this case, it is expected with a decrease in testosterone levels to continue receiving testosterone injections price propionate 50 mg once every two days. After the start of the activity enanthate, propionate additional reception is optional. (In this case, the athlete receives a rapid increase in testosterone levels, but due to the intake of testosterone enanthate is also very long). To summarize: the success by taking testosterone propionate depends on regular injections of relatively small doses of the drug. As mentioned above, when receiving our parallel application of testosterone query another prolonged exposure to injection for the athlete less water accumulates when several parallel long-acting injections are used. To speed dial muscle mass and growth, it is a good combination to receive 100 mg of testosterone propionate (every two days), Winstrol (once daily) and 30 mg Danabol again every day. Speaking of side effects, while injections of testosterone propionate, worth mentioning that are not so pronounced and appear to a much lesser degree, compared to other testosterone esters. And it's not even a weekly dose and a minor adjustment of the drug in the body. You should also take note of the fact that testosterone propionate buy Spain softer and harmless chemical from the list of testosterone, so it is better tolerated by the body, which is a great advantage. And yet, since we do not want, and testosterone propionate, which is a chemical. cause some substance where something similar to testosterone esters, which do not, the side effects such as hair loss, voice changes, the rapid growth of body hair. But there is a little toxic effect on the liver, and its damage is almost impossible, so, if you are, of course, do not overdo the dose. Therefore, perhaps the biggest drawback of testosterone propionate is a need for frequent use.